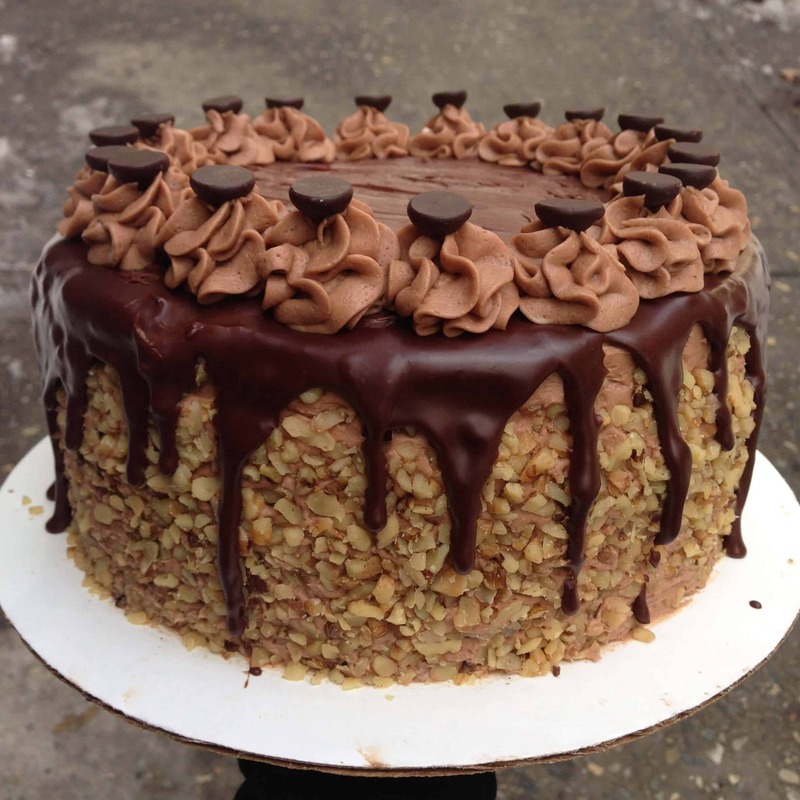 I received a cake order for something chocolaty and nutty, and ended up with this: A Chocolate Almond Birthday Cake. I used my favorite chocolate cake recipe modified from one of my favorite bloggers, and my standard chocolate buttercream recipe. Preheat oven to 350 degrees F. Line and grease three eight inch cake pans. Place the chopped chocolate and cocoa powder in a medium bowl. Pour the hot coffee over the mixture and whisk until smooth. Refrigerate mixture for 20 minutes, until cool. Meanwhile, whisk together the flour, sugar, salt and baking soda in a medium bowl; set aside.Whisk the oil, eggs, vinegar and vanilla extract into the cooled chocolate mixture until smooth. Add the flour mixture and whisk until smooth. Divide the batter evenly between three 8 inch cake pans. Bake until the cakes are set and just firm to the touch, 20-25 minutes. Cool the cakes in the pan on a wire rack for 10 minutes, then remove the cakes from the pan and place on the wire rack to cool completely, about 1 hour. While the cakes cool, prepare the frosting. Whip the butter until light and fluffy (about 2 minutes). Gradually add in the powdered sugar and cocoa, alternating with splashes of cream. Mix in the melted chocolate, salt, and vanilla, until fully incorporated. Add additional cream or powdered sugar as needed until desired consistency is reached. To make the chocolate ganache, pour the chocolate chunks into a heat proof safe bowl. Bring the cream to a boil, and pour over the chocolate. Let this sit for 2 minutes, then stir until the chocolate and cream are fully incorporated. Set aside and let cool for about 15 minutes, so that the mixture can thicken. To frost the cake, frost the first layer of cake with buttercream, and top with chocolate chips and crushed almonds. Repeat with remaining cake layers, and apply a thin crumb coat to the exterior of the cake. Refrigerate for 30 minutes, to allow the crumb coat to harden. Apply a thick coat of buttercream, reserving about 2/3 cup of frosting to pipe swirls on top of the cake. Press crushed almonds onto the sides of the cake. Once the ganache has thickened, pour onto the top of the cake, and push it towards the edge of a cake with a spoon. Let the ganache spill over the sides of the cake. Using a large open star tip, fill a frosting bag with the remaining frosting and pipe swirls around the top of the cake. Press chocolate chips onto the top of each swirl, and refrigerate to allow the frosting to set. Please make this cake for me! If you enjoy Good Sweets you must check out this site!